I got to learn about Hasiru Dala when I started volunteering with Buguri a couple of months after moving to Bangalore in January this year. Having volunteered with a community library in Delhi, I was excited to hear about the birth of one in Bangalore and wished to join their journey in creating a dialogue about reading and books. After meeting Lakshmi and talking to her about Buguri and its goals, I have visited the library several times. Each time I visit, it is a delight to see how it is growing, the children peeking in before coming inside to browse through the books or settle down to hear a story. Their anticipation and excitement is strongly palpable as soon as they enter inside the comforting, nurturing space that is Buguri. There was a similar contagious excitement filling the air on Friday, 19th May at Freedom Park. Soon after us volunteers and a few facilitators had gathered at the entrance along with Lakshmi, Sangeetha, and several others, the brightly dressed, chattering and laughing children poured in along with their teachers. Once the registrations were complete and badges were pinned to their dresses or shirts or salwar kameez, I asked them to pose for pictures as that was one of my volunteer responsibilities and they cheerfully did so. As we waited for more children to arrive, the ones who were already there assembled in groups with their respective facilitators and volunteer support. As they sipped milk and snacked on cookies, a few children decided to amaze us with their incredible dancing skills. Equipped with three left feet, if not five, I am always in admiration of those who dance and these kids’ dancing left me speechless. The day was structured in two sessions with several workshops taking place in each: storytelling, crafts, theatre games, martial arts, and pottery to name a few. Once the kids settled down into their groups and facilitators, they became instantly engrossed and involved in the spirit of those sessions. I happened to help out Shylaja Sampath who was conducting a storytelling and visual arts workshop; after narrating a story, the children then proceeded to sit down and draw, filling their pages with brightly hued homes, which they would take to their own homes afterwards. I witnessed a great deal of energy and excitement in whichever workshop I happened to see – and what better way to harness it than a session of clowning? 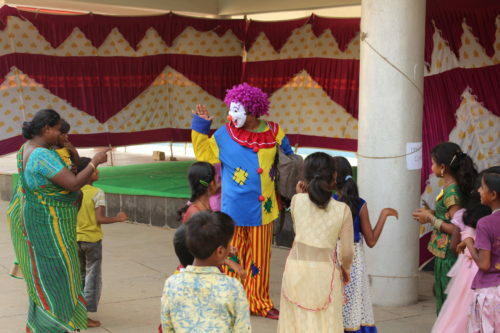 I have to admit that I had never before encountered a clowning workshop so I was as curious as the kids to see what its facilitator, Harish Bhuvan had in store for us. 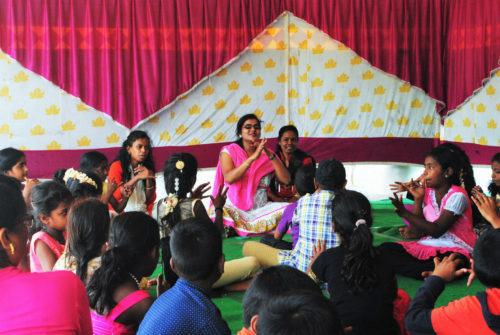 He swiftly drew the kids’ attention towards an an intriguing session of performance, mime, expressions, and gestures; at one point, as part of the performing exercises, the kids even ‘slept’ for a while before sitting down to hear a story and indulge in a little more theatre. The day finally ended with the all important oath taking ceremony where the children committed that neither they nor their peers will drop out from school as well as sharing their thoughts about their experiences during the day. It concluded with a vote of thanks to the facilitators and volunteers; I along with several of them were kindly honored in front of a cheering crowd and given a thoughtful gift of a budding mogra plant. Even though it had been a long day, the children’s energy, pleasure in participating in these activities, and affection made it such a memorable experience. I set off home, wearing a big smile, cradling my plant, and twirling a beautiful champak flower which was presented to me by one of the children that I was working with in the sessions. It was a lovely memory to round up the day! Thank you, Lakshmi, Sangeetha, and all the other facilitators and volunteers who participated on Friday, it was wonderful to work alongside you – look forward to doing so next year along with seeing all the children at the camp once again! Priyanka is volunteer who was a part of summer camp and regularly volunteers at the Buguri community library.